Watch this video to learn about our new SolarWinds® product features that are of most interest to our government customers. 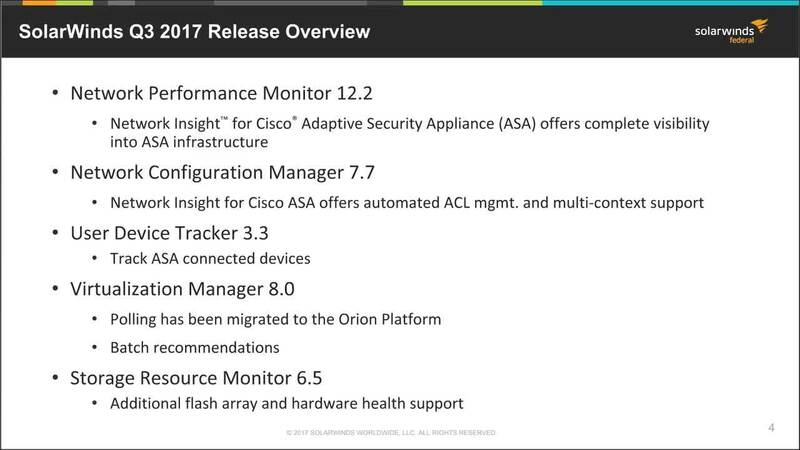 The Federal Sales Engineering team discusses upcoming Q3 2017 releases, including a new Network Performance Monitor 12.2 and Network Configuration Manager 7.7 feature called Insight for Cisco Adaptive Security Appliances (ASA). This video also reviews Enterprise Operations Console 2.0, and Virtualization Manager 8.0, as well as High Availability 2.0, PerfStack™ 2.0 and other Orion® Platform improvements.